Early American token, depicting Conanicut Island with rows of American and French soldiers fleeing towards small boats offshore while Admiral Howe with his three menacing triple masted ships lie just offshore. 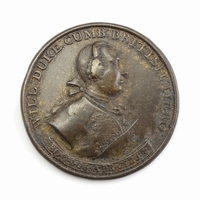 The tokens were minted in England in 1779 and distributed throughout the Netherlands in an attempt to diminish the Dutch sympathies for the American cause. The propaganda was not successful as the Dutch joined the League on December 20, 1780. The token has been converted to a pendant with a pierced hole. Type without wreath below the ship. Obverse: The flagship of the British Admiral Lord Howe. Legend: DE ADMIRAALS FLAG van ADMIRAAL HOWE 1779. Reverse: The retreat of the American forces from Rhode Island in 1778. Legend: D'vlugtende AMERICAANEN van ROHDE YLAND Aug't 1778. The Battle of Rhode Island took place on August 29, 1778. Rhode Island was the first of thirteen colonies to renounce allegiance to the British Crown on May 4, 1776. During the Revolution, the British occupied Newport, situated on Aquidneck Island in December 1776. Continental Army and militia forces besieged the British forces in Newport to drive them off Aquidneck Island. The battle ended inconclusively, but the Continental forces withdrew to the mainland and left Aquidneck Island in British hands. The British abandoned Newport in October 1779 to concentrate their forces in New York City. The Battle of Rhode Island was the first cooperation between the French and American forces and is also notable for the first participation of the 1st Rhode Island Regiment under the command of Colonel Christopher Greene.